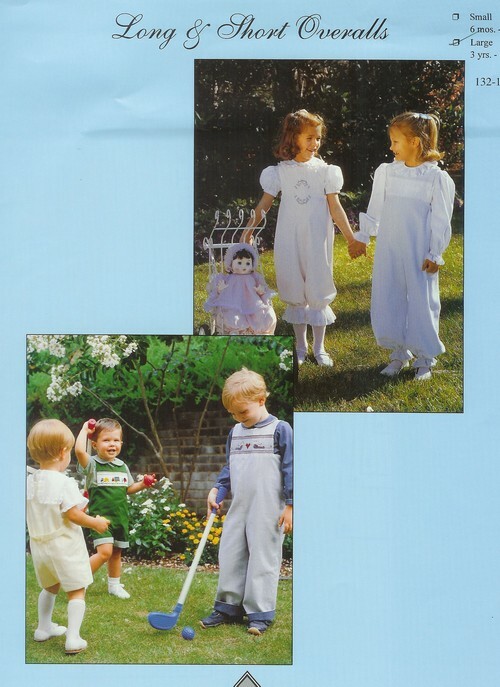 Long & Short Overalls can be sewn for a boy or a girl. The overalls button at the shoulder & can have a smocked inset, left plain, machine or hand embroidered or applique. There is a shirt pattern included w/short or long sleeves. Sleeves can be banded or trimmed w/lace for the girl version. The shirt also has 4 collar variations. The boy's version can be belted in the back. Select Pattern Size option 6 months - 3 yr. 3 - 6 yr.